A cricket match in progress at Guaracara Park. THE VENGEANCE of moko has fallen on Petrotrin, OWTU and the southland. Pointe-a-Pierre has the silence of a cemetery, the stillness of a ghost town and an eerie atmosphere. Those in the land of the living are still coming to terms with the reality of the impact of the closure. Can you imagine the disappointment when I went to Guaracara Park with my 2018 membership card (which expires on December 31) and saw the gates tightly bolted? I thought of demanding a rebate. But from whom? I considered jumping the fence, but I would be a trespasser or stormer in my own club. My 100th impulse was to go into Marabella and take a drink. My pocket change did not allow me to drink, get drunk and drown my sorrows. For four and a half decades if you could not find me home I was sure to be at Guaracara Park. This place was my school where I taught hundreds of children and adults the sport of tennis. The venue was my church for those who avail themselves for a sermon on tennis on a Sunday. The park was my wellness centre. The greenery, the birds and the ambience all served to de-stress, rejuvenate and recreate, sparing no time for idleness to turn bad boy. I still cannot believe it. Once the mecca of sports in TT, the park was graced by countless national and international athletes of the highest order. No other sporting venue in this country can boast of an illustrious history like Guaracara Park. When I heard them say they were closing the refinery, I said nice, clean air for Guaracara Park. Tracing the name change from Texaco to Trintoc to Petrotrin to Petrotrin-no-more I now realise that the authorities were rewriting the epitaph of the club. Closing the refinery is a serious matter. Closing a sports club is a serious joke. Southerners are dumbfounded as we mourn this demise. The cry in town is pressure because this thing is like a police boots on a corn. When you close a sports club you are practically shutting down a wellness centre and making room for a hospital at the same time. Guaracara Park was a true grassroots facility that even executives frequented. Many “big pappy” in Texaco days used the park as a watering hole after work. The multinational corporation had good reason for establishing this facility for its workers. The stress of work was relieved through participation in sports. This was a rehash of the age-old philosophy that modern-day businesses are trying to reintroduce in First World countries. To close a sports club is an indictment against the workers’ welfare and shows ignorance about what impacts their productivity. What is priority in TT, health or profit? Sporting facilities or hospitals? Prevention or cure? Who are these architects of modernisation? When Texaco left at least three clubs went in oblivion. When Caroni 1975 Ltd closed its doors Sevilla and others folded up. With the advent of NAPA, the Colonial Tennis Club disappeared. 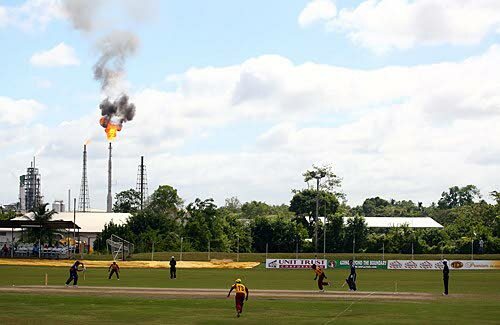 Now there is a parallel with Petrotrin closing and the clubs that promoted sports going the same route. The state-of-the-art Aquatic Centre, Cycling Velodrome, National Racquet Centre and Brian Lara Cricket Academy are not walk-in centres and are managed by either prohibiting, under-utilising or limiting usage. Apparently the advisers are not aware that this Prime Minister occasionally sneaks out of the hotbed of Parliament to seek solace or regain his sanity on the golf course. I am certain that he has not forgotten the therapeutic effects of playing a sport. Yes movers and shakers, it is the same Dr Keith Rowley who commissioned the National Policy on Sport 2017-2027 to take sports to the next level and promote physical education in schools. Sport today is the same in TT as when Pope Francis was an acolyte. The powers that be have entertainment allowances while the “roots” cluster in bars to take a drink. The authorities join exclusive clubs while the man in the street could barely manage an annual subscription of $300. Those who call the shots jet off to foreign lands when they get sick but we have to line up at public institutions with a prayer book. Imagine closing a hospital. Have they forgotten that as we grow older we need more medical attention? Their actions have spoken: one wealthy executive is equivalent to thousands of impoverished and unhealthy plebeians. The governance of a people is not about balancing a budget and their invaluable well-being cannot be measured using the profit formula. This is a word to the wise to save our souls. Reply to "The demise of Guaracara Park"